Cyber Monday's deals are even better than Black Friday's deals, my loves!!! Can you believe it? I picked 16 best items for you girls, treat yourself or gift your family and friends, you just can't go wrong with these picks. I want to highlight a few sales. 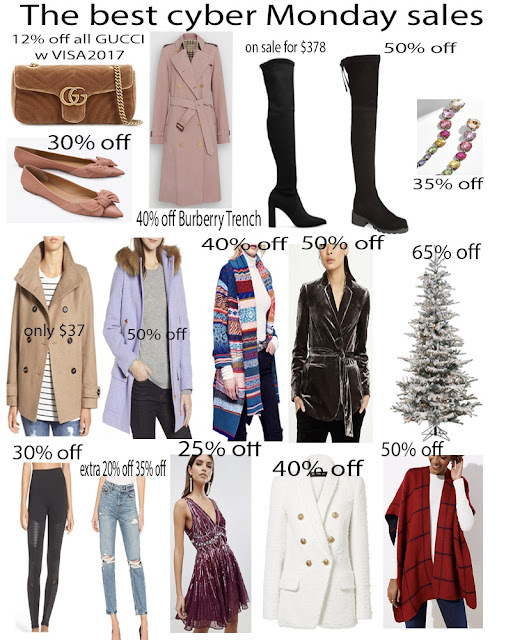 Burberry has up to 50% off. I recently got a Burberry trench coat and I'm madly in love with it. I feel so lucky:P Can't wait to share with you girls!!! Extra 20% off already on sale Stuart weitzman boots with code CYBER20. This pair is $378 after the extra discount and most of the sizes are still available. This pair is 50% off. You know how good they are if you already have a pair cause they fit like gloves. Even I have multiple pairs, I still want to get them in other colors and styles:P What can you do, haha? Nordstrom has up to 60% off Cyber Monday sales. On top of that, when you spend $250, you will get a $50 gift card. They didn't have the gift card event on Black Friday, that's why this deal is even better!!! You girls know how much I love Nordstrom! SHOPBOP has extra 30% with code WOW18. My all time fav jeans are on sale for only $43 right now. J.Crew has extra 60% off sale style and 50% off everything else with code CYBER. Tory Burch has 30% off with code THANKS. NAP has extra 15% off on sale items marked as 'SALE MUST-HAVES' with code CYBER15. Baublebar has 35% off everything with code CYBER35. ASOS has 25% off everything with code EPIC25. Everlane has choose what you pay, which has up to 35% off. A lot of my shoes are on sale! Revolve has extra 20% off on sale items with code CYBER20. So this pair of boyfriend jeans is extra 20% off on top of 35% off. Express has 50% off everything. LOFT has 50% off everything with code CYBER. SAKS has up to 70% off on selected style. Get $50 off every $200 you spend up to $500 in savings with code MONDAY18. Neiman has up to $750 gift card with code GC4YOU. BG has up to $400 off on all beauty items with code BEAUTY. It is best for purchasing La Mer and La Prairie. I just received my Dyson v8! Love it so much! You girls can still get yours on sale.